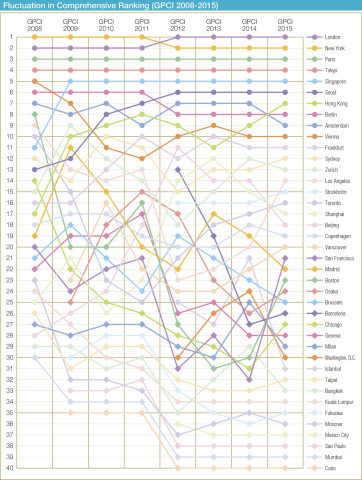 TOKYO--(BUSINESS WIRE)--The Mori Memorial Foundation’s Institute for Urban Strategies, a research institute established by Mori Building, unveiled today the results of its Global Power City Index (GPCI) 2015 report, which ranks 40 global metropolises according to their “magnetism,” or power to attract creative individuals and enterprises from around the world and mobilize their assets for economic and social development. 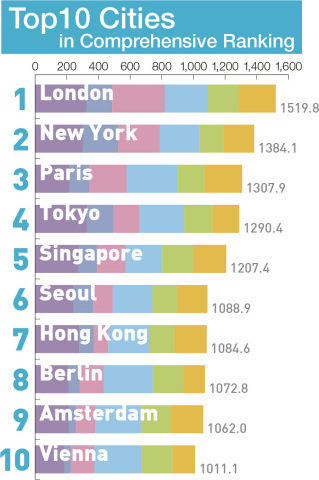 Like last year, London, New York, Paris and Tokyo took the top four spots, in that order, while Los Angeles, San Francisco and Hong Kong showed significant improvement. London, which has held the top spot every year since hosting the 2012 Olympic and Paralympic Games, ranked among the top three in all categories except Livability and Environment this year. With a long-term focus on redevelopment, the city continues to pursue development projects, including post-Olympic initiatives such as the establishment of Queen Elizabeth Olympic Park and construction of the Crossrail line. New York, home to many of the world’s top universities and the largest number of theaters and concert halls, is an inspiring environment for the talented individuals that gather there. New York held on to second place for the fourth year running, trailing only London. Paris was first in Livability and Accessibility, largely due to its concentration of cultural, historical and traditional sites within a compact city center, making its urban assets highly accessible to visitors and residents alike. Paris has stayed in third place since 2008. Tokyo strengthened its Cultural Interaction, as reflected in the city’s rapid increase in foreign visitors and exchange students. Tokyo has held on to fourth place since 2008. Los Angeles, San Francisco and Boston significantly improved their rankings, largely due to continuing economic recovery from the 2008 financial crisis and accompanying improvements in Livability. Increasing international flights for passengers and cargo raised Singapore’s Accessibility, closing the gap with Tokyo. Beijing and Shanghai fell in their rankings, as in the last few years, while Hong Kong greatly improved its score for Livability and jumped ahead in the overall ranking. Geneva, Frankfurt, Stockholm, Zurich and Vienna took the top five spots in Environment thanks to highly advanced environmental policies. Elsewhere, Vancouver made huge gains in its Environment ranking to jump from 23rd to 7th. The institute has published the GPCI report annually since 2008. GPCI uses 70 indicators spread among the six functions of Economy, R&D, Cultural Interaction, Livability, Environment and Accessibility, analyzing the strengths and weaknesses of global cities amid intensifying competition. The rankings also reflect the viewpoints of global managers, researchers, artists, visitors and residents. GPCI, highly regarded by organizations worldwide, is used for urban development and branding by policymakers around the world. The institute conducts multidimensional comparative research to help governments and businesses identify key strategies that enhance the competitiveness of their cities as attractive, nurturing urban environments. In turn, the institute’s initiatives contribute to international policy dialogues, including its Global Power City Index (GPCI), which is highly regarded as a leading index for global cities. The Mori Memorial Foundation was established in 1981 with a donation from Mori Building, a leading urban landscape developer that creates groundbreaking concepts for urban living in Japan and the rest of Asia.